Thanksgiving is over and it’s time to get the tree up and decorated. Of course we all want our tree to be bright and beautiful, and that’s why we put so much effort into decorating. Cleaning your Christmas ornaments before hanging them on the tree is an important step in keeping your tree beautiful and making sure that your ornaments stay beautiful for years to come. Start by making sure that you have the right equipment for Christmas ornament cleaning. Next, separate all your ornaments and divide them for easier cleaning. Each type of ornament is cleaned differently. Glass, acrylic or perspex Christmas ornaments are cleaned by spraying a bit of glass cleaner on a clean cloth and gently wiping the surface. Glittered ornaments can be cleaned with a gentle dusting of a feather duster. 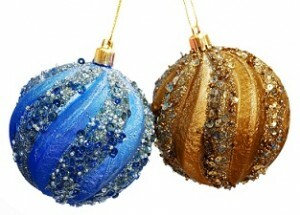 If too much glitter is coming off, then gently blow on the ornament and forget about any dust that won’t go away. Crystal and porcelain ornaments are best cleaned with either a feather duster, or a gentle cleaning with a soft, cotton cloth. Hand painted ornaments must always be cleaned while wearing gloves, so that the oils from your skin don’t damage the paint. Clean hand painted ornaments with a feather duster, and never use any cleaning products as they can easily damage the paint. Wood and Resin ornaments are best cleaned by gently rubbing them with a soft cotton cloth. Gold and silver ornaments are cleaned with jewelry cleaner and a soft cotton cloth. Keeping your ornaments clean will not only make your tree sparkle, but it will also extend the lifetime of your ornaments so that you can pass them down for generations. Merry Christmas.